Thank you Ruth for bringing us together to focus on our celebrations. Please visit her site to see what others are celebrating. Check out #clebratelu on Twitter too. Cathy and I are kindred spirits and we always get a chuckle at the way we work together. When we present together, you'll find us hurriedly finishing up at the last minute...each apologizing to the other for leaving things to the last minute; both secretly glad that we understand each other's ways so well. 1. The holiday mess is finally cleaned up. Zach has gone back to school, which means my kitchen will stay clean. (It also means no more fresh bread waiting on the counter for me). 2. I unsubscribed all of those annoying emails that at one time I thought I needed. 3. I got some writing done that's REALLY needed to get done. 4. I read 5 books over break...4 middle grade books and one professional book. I loved them all and it gives me something to blog for It's Monday, What Are You Reading? 5. I downloaded a new book on my iPad (You're Made for a God-Sized Dream by Holley Gerth) and will be reading it with my sister who lives in Florida and 2 friends from school. 6. My husband and I tried a new restaurant today. Since no one in my family (besides me) likes sauerkraut and my son is a vegetarian, we didn't have the traditional pork and sauerkraut dinner on New Year's Day. 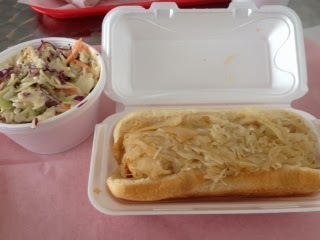 I got a kraut dog today, which I think counts as my good luck pork and kraut. Don't worry...I am still procrastinating on getting lesson plans done. I'm hoping that the snow storm that is forecasted means another day off school on Monday and I'll get one more day to procrastinate. I hope this week brings you many things to celebrate! Tonight is my night to start making the lists of things to do during the week next week! I have meetings & lessons on the calendar, but need to prep each day for the night before. I had great plans to do more for school, too, Julie, but the best I did was work together with a few on twitter to start a new reading challenge for us. I did read, & loved the time to do it! This week was catch up & errands, etc. Next week, no more procrastinating! Love the comic & that Buzzfeed-I guess we all do some of that. I did 'act', but only what I wanted really. I guess a lot of you may have a snow day on Monday-several are talking about it! Best of wishes for that! I am a procrastinator too....no lesson plans done yet! I am expecting a snow day or possible even more, so I am not worried...yet! I just bought God-Sized Dream too. Anxious to get started reading it. We'll have to share thoughts. She is starting a challenge this week too. I am thinking about doing it. Michelle Haseltine is too. Here is the link if you are interested. Good luck with your snow day...I mean procrastination day! It is so cool to try new things. It's just so much easier to go with the flow that I don't always think of it. Have a blast! I just love having a procrastinating friend. I wonder how can procrastinating be so bad when it helps us get so many other things done? You've gotten a lot done! You should be celebrating. I didn't get one professional book read over break. Goodness. I'm going to have to check out "I Dare Me." It's the perfect book for my One Little Word. You're always pushing me along --- and reading my mind. You seem to always know just what I need. Put your feet up and relax. You deserve it! I am with you on the procrastination. I'm sure Future Me would like to punch me on a regular basis. Just for instance...I haven't opened my school bag yet. Yet. I AM going to get rid of a few more email subscriptions that I find myself deleting without reading. Who am I kidding? Clear some clutter. Oh Julie, here I am thinking about my lesson plans (key word: thinking). Do I really need to get them ready today just to change them tomorrow if we have a snow day? I also just found Holley's website during the break! I love it! I download one of her other books, but the one you mentioned is on my list. Keep me posted how you like it. No one can ever keep going and be productive all the time. May be procrastination is a way to collect oneself to get something else done in a shorter time. (All of this could be my justification for postponing some tasks.) I am curious to hear what you try during your "one new thing a week" experiment. Slice of Life Tuesday...What is That?